I rarely find myself in the houseware section of any store and I'd rather remove a splinter from my foot with a chainsaw than shop for window treatments. But a few weeks before Christmas, we ran into a store looking for a last-minute gift. Jilda walked with a purpose, I ambled along behind her checking my email on my phone. When I looked up, she was in the houseware section. She moved off to another aisle as I looked absent-mindedly at the offerings on the shelves. Midway on one shelf was a collecting of things that were marked down to a fraction of their original price. A card of led lights on a thin wire caught my eye. I was thinking they'd look good on one of our wreaths or maybe around one of the Christmas features on the mantle. When I showed it to Jilda, she said I have a great idea! At home, she went to the TV room which doubles as our storage room. Pulling an empty Mason Jar from a shelf, she said "This is what we need. 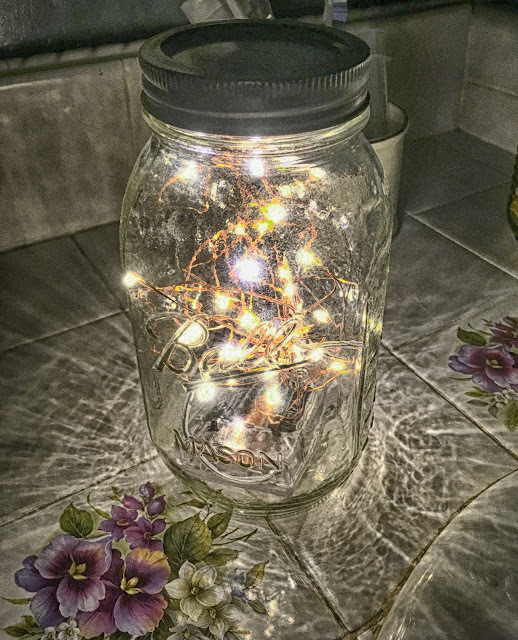 She took the tangle of tiny led lights, wadded them up and put them into the Mason Jar. They are powered by a couple of AA batteries and when she'd finished, she took it into my bathroom and put it on the sink basin. Now each night when we go to bed, our bathroom glows softly from what looks like a Mason Jar full of lightening bugs. I love a great imagination. It is lovely. I like your imagination. Brilliant idea. And how I would love to see fireflys. I got a pretty bowl filled with lights like that and it was covered by a small doily for a gift one year, only mine has to be plugged in. How nice you found some battery operated ones. They do put off a nice glow. see? And you were gonna put it around a wreath. Now you have a sweet light to use year round. Leave it to Jilda. After getting over your effort to remove the splinter, I saw the picture and thought you and nephews and nieces had caught lightening bugs. Yes it is a great idea. Oh yeah, Alphie soup's comment is cute! What a clever idea. I just might try this. The lid needs some holes! Cute idea, You can also use it on the deck for a nice evening of relaxing with your lovely lady and a glass of wine. It kind of looks romantic. That's a smart lady you're married to! !